Do you already know how to surf, but you need to get some surf equipment for your surf holidays? There are many possibilities in Portugal to rent different surf boards and wetsuits. Even surf vans rentals are available in Portugal. 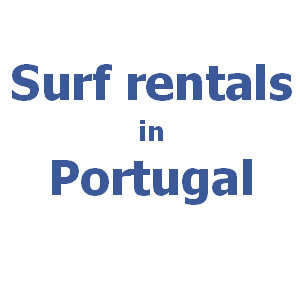 Renting of surf board in Portuguese rentals is a comfortable way of “travel and surf” in Portugal. Read tips from experienced surfers for travelling around Portugal with renting surfboard and wetsuit for individual surfing. You can rent the surf boards for an hour, day or week. The longer period of surf renting is much more cheaper. The prices of surf rentals also differ according to the type of the board you rent. To rent fibreglass board will be a little bit more then epoxy. Prices of fibreglass boards can be from around 25 EUR a day. The epoxy board rental is from 20 EUR a day. If you are not extremely hardened you will need to rent the wetsuit for sure. The prices for wetsuits renting are around 10 EUR a day. By renting a surf for one week of your surf trip you can get cheaper price for a day. It can be around 20 EUR fibreglass surf board, 15 EUR epoxy surf board and 7 EUR wetsuit. Renting a surf board and wetsuit together can be cheaper. Moreover, surf schools have special packages if you stay in their surf camp or surf hostel. The prices differ also according to each surf spot. Some surf shops and surf schools in Portugal might have different prices for renting during the high and low season. Get inspired by surf rental Peniche to know the actual conditions and real prices of good surfboard rental in Portugal. Be prepared that the surf school can ask you to guarantee the rental by your ID or passport. Usually if you rent the surf equipment for more days you will be asked to pay deposit.